1869 is a fun 17th century trading game that is similar to its contemporary High Seas Trader but with more emphasis on trading and planning routes than on naval navigation. The game also (perhaps unwittingly) borrows concepts from Sid Meier's classic Railroad Tycoon to good effect, such as random special shipping assignments that will earn you extra cash if you complete it in time. 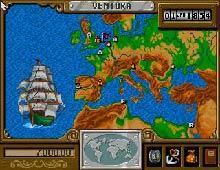 Plan your trade routes, organize a fleet, and finances carefully-- this game is no cakewalk :) Definitely a great game that finally put underrated developed Max Design on the map.